When Lana’s Grandpa Howe marries Cassie’s Grandma Tess, Lana and Cassie only expect to see each other at awkward family gatherings. And for Cassie that’s perfectly fine. But for Lana, it just isn’t. This is Lana’s chance to not only gain a cousin, but a best friend. So when Grandpa Howe and Grandma Tess announce that both Lana and Cassie are coming along for a road trip adventure, both girls are a bit nervous – one more so than the other. For different reasons, both Lana and Cassie are hesitant. Even though Cassie is happy to spend time with her beloved Grandma Tess, she isn’t exactly thrilled to be sharing that time with boring old Lana and weird Grandpa Howe. Besides that, she’s worried that her friends back home will forget all about her. While Lana is over the moon happy to get to know both Cassie and Grandma Tess, she’s worried about things at home. Her mom seems to be getting sicker and sicker. She hopes giving her mom some peace and quiet will make everything better. With brave faces both girls hop in the backseat, buckle up, and sing along with the show-tunes blasting from the car stereo. Little by little both Lana and Cassie form a bond and a friendship. Will these two new cousins survive a summer trapped in the backseat of their grandparent’s car? Will Lana and Cassie’s friendship be strong enough to survive the secrets they are hiding from one another? 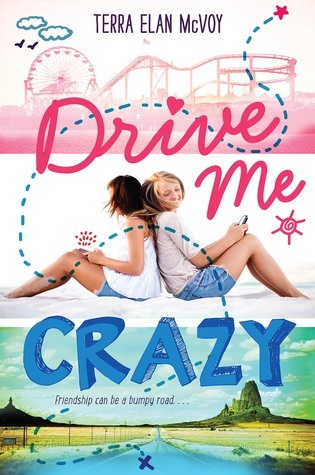 Drive Me Crazy, written by author Terra Elan McVoy, is a debut middle grade novel that, not only captures the nuances of becoming a teen, but will capture reader’s hearts. The writing that fills the pages of this book is simply dazzling. Told from alternating perspectives – from both Lana and Cassie’s – author McVoy truly excels at giving each character the chance to tell their individual stories. Because of this – young and older readers alike – will get the chance to, not only know each of these unique girls, but also get the chance to see a little bit of themselves hidden within these magnetic characters. Lana and Cassie truly are characters that readers will easily relate to. Beyond that, they are characters they will instantly root for. And it’s because they were crafted as being so openly honest, and so incredibly emotional. Beyond that, each of the girl’s are going through a lot during the course of the book. Cassie is struggling with the pressures of fitting in and the ever-changing emotions of a tween girl. On the other hand Lana is dealing with the realities of having to grow up too quickly, and deal with a situation that is super scary for any person, let alone a tween girl. And even though it may seem like one issue is bigger than another, author McVoy does not treat them that way. The issues that Lana and Cassie are dealing with are real and treated equally. And McVoy handles them with grace, sensitivity, and the utmost care. I originally went into this book simply because of the road trip aspect. I’m a real sucker for a good road trip book. And this book captured all the qualities I love – adventure, wanderlust, and of course magic. Drive Me Crazy had it all. To say I loved this book is an understatement. Readers, read this book! McVoy’s way with words is apparent, the characters are real, and the plot will take you on an unforgettable adventure!